This dazzling backless gown has bang on trend drop sleeves with a magical tulle train. In a flattering modified A line shape, Winnifred is perfect for brides with curves who want to show off their shape. Be a little different and opt for one of the subtle shades under the ivory lace for a dress with a difference. 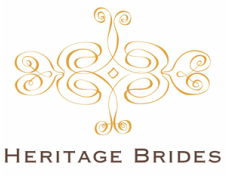 The sample at Heritage Brides has an ivory lining with an ivory lace. The lining is available in almond, blush, chardonnay and ivory.